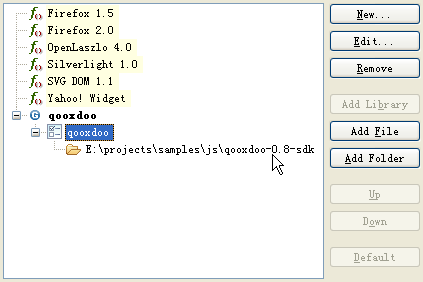 Only qooxdoo 0.8 is support, download qooxdoo SDK and unzip it. Click the New.. button. In the Name field, type qooxdoo as the name for the new profile. Then click OK.
Click the Add Library button. From the Library drop-down list, select qooxdoo. Then click OK.
Click the Add Folder button, choose the folder. Select the qooxdoo profile created in step 3, click the Default button make it the default profile for all project. The default profile can also be configured per project by using Configure Project Specific Settings... link. The code assist list all the built-in class with full documentation. The code assist will list all the properties and where it was defined. Select qooxdoo function, use the Ctrl+Click combination or F3, you can jump to the qooxdoo source code, help you to learn how qooxdoo works.